Keep storage boxes closed when driving: Driving with the storage boxes open is dangerous. To reduce the possibility of injury in an accident or a sudden stop, keep the storage boxes closed when driving. Do not put articles in storage spaces with no lid: Putting articles in storage spaces with no lid is dangerous as they could be thrown around the cabin if the vehicle is suddenly accelerated and cause injury depending on how the article is stored. Do not leave lighters or eyeglasses in the storage boxes while parked under the sun. A lighter could explode or the plastic material in eyeglasses could deform and crack from high temperature. This console box is designed to store eyeglasses or other accessories. Push and release to open. 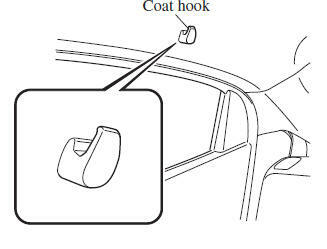 To open the glove compartment, pull the latch toward you. To close the glove compartment, fi rmly press in the centre of the glove compartment lid. Never use a cup holder to hold hot liquids while the vehicle is moving: Using a cup holder to hold hot liquids while the vehicle is moving is dangerous. If the contents spill, you could be scalded. A cup or small items can be placed on the centre console tray using the centre console divider. The centre console tray is large enough to place a small item when the centre console divider is not in use. Never hang heavy or sharp objects on the assist grips and coat hooks: Hanging heavy or sharp-ended objects such as a coat hanger from the assist grips or coat hooks is dangerous as they can fl y off and hit an occupant in the cabin if a curtain air bag was to deploy, which could result in serious injury or death. Always hang clothes on the coat hooks and the assist grips without hangers.